London is full of places to get conversation started on a first date. This Date Walk will take you to plenty of interesting places in London, helping you to work out whether or not your date is the right person for you along the way. Along the route you'll be able to discover what your date likes to eat, what they like to drink, their TV preferences and even what they think about modern art. Plus, if your date is going as badly as a bakers on Pudding Lane, there are several escape points along the walk at which you can bail out. With so much food on offer at Borough Market, there'll be plenty of talking points to help you break the ice on your date. 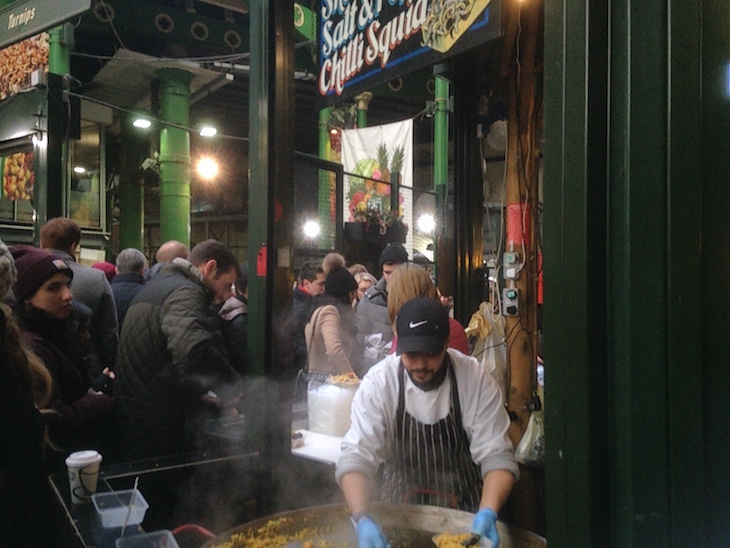 Start at Borough Market, one of the oldest and largest retail food markets in London, but also the hub of modern London foodies. The incredible variety of edible wonders makes it the ideal place to get to know your date’s tastes a little better. Do they know their brassicas from their Brazilian cuts of beef? Does your date have a dietary requirement you should be aware of? Do they think food is best bought in single-serving packs from M&S and reheated in the microwave? All important questions to answer during this initial stop on the Date Walk. If things are going well — or if they need livening up — there are plenty of pubs and wine bars nearby to nip into. 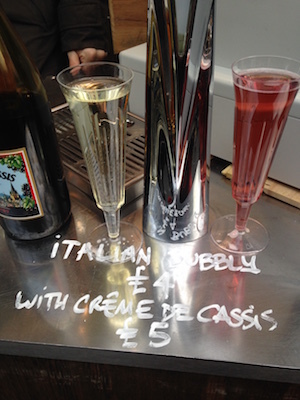 Maybe you need to make your date have a little extra fizz? Photo by Allison Goodings. If your date needs some romantic inspiration, Borough Market is also the home of London’s most famous singleton — the 2001 movie Bridget Jones’s Diary was filmed here, with Bridget living in a flat above the Globe pub. 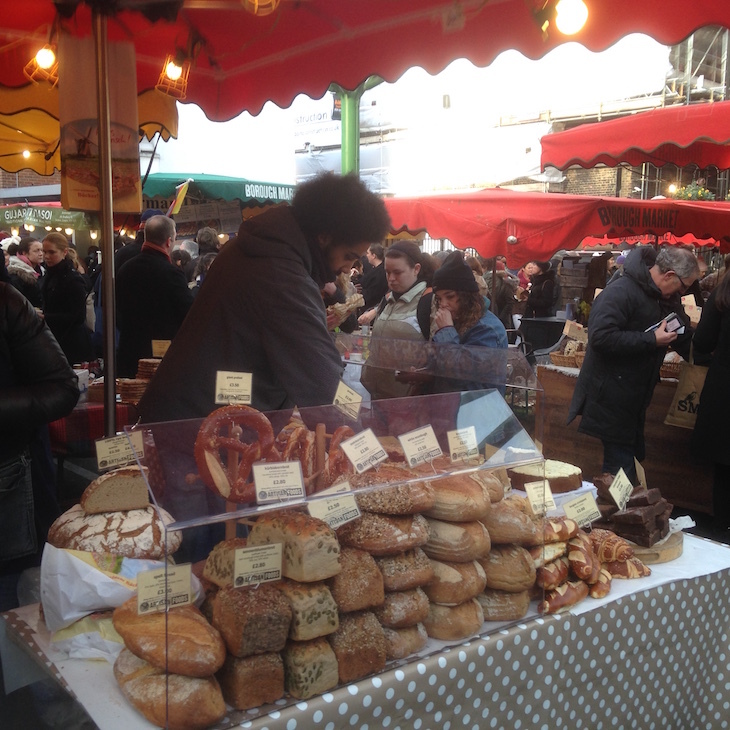 And if things are proceeding badly, there’s no harm in bailing out at Borough Market and heading for home the way you came in, consoling yourself with some chewy brownies from one of the many stalls. However, if your date has passed this first stage, head along Winchester Walk at the bottom of the market and then turn right onto Stoney Street, then left onto Clink Street (going right takes you back to the market and, if you need a make a hasty exit, London Bridge station). Pass the Clink Museum with its replica gibbet (is your date into horror?) and underneath another railway line, emerging by The Anchor pub, which is believed by some to be the "little alehouse on the Bankside" from which Samuel Pepys watched the Great Fire. The Cheesegrater, The Walkie Talkie — but what other names can you come up with for London's skyscrapers? Photo by Allison Goodings. From here, you get a good view and can impress your date with your knowledge of the funny nicknames of buildings on the London skyline. This isn't the first Date Walk pub (there are a couple in Borough Market) and it’s not the last either. Pubs are useful things on the Date Walk. As well as convenient toilet stops, they’re quick and easy ways of finding out what your date drinks, how much your date drinks and whether your date will stand their round. Along from the Anchor and after passing under Southwark Bridge (which, should you desire an escape route, can be crossed to reach the tube at either Mansion House or Cannon Street), there’s a little bit of history with which you can impress your companion. By the side of the Real Greek restaurant is the Ferryman’s Seat, the last surviving example of a seat where ferrymen waited for their customers in the days when there was only one bridge over the Thames. The Ferryman's Seat. Photo by Allison Goodings. Further along the Thames there follows some opportunities to engage in high culture. At the Globe Theatre you can establish mutual feelings on Shakespeare. At the Tate Modern you can determine if your date really knows their Pollocks. The last thing your date could see of you if you choose to escape via Thames Clipper. Should you have such differing opinions at this time and there’s not much of a future, escape is at hand. There’s the Bankside Pier, from which you can escape the Date Walk in a dramatic fashion by way of the Thames Clipper. If a speedy wet exit isn’t your style, you could escape on foot via the Millennium Bridge and catch the tube at St Paul’s. Are things are going well? How about celebrating making it this far with another drink? 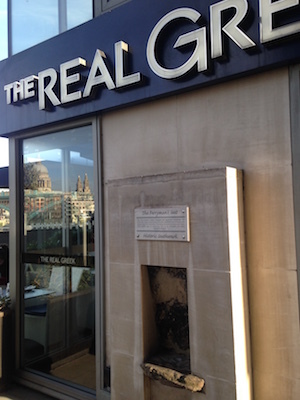 Conveniently, the Founders Arms is close by, with heated outdoor seating and views of St Paul’s. 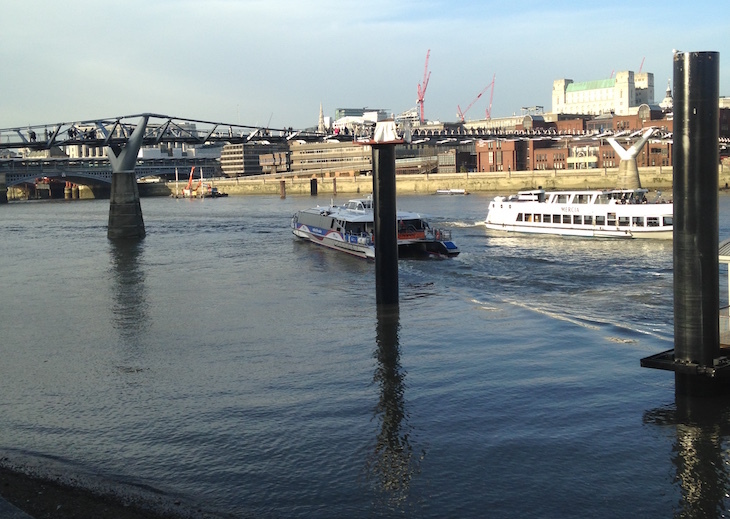 If now's the time you find you need to bail out, Blackfriars station is very close at hand. Blackfriars Bridge. Photo by Allison Goodings. The Date Walk continues, passing through the subway underneath Blackfriars Bridge to emerge by some fine examples of concrete, brutalist architecture. A good opportunity to discuss housing and find out if your date owns or rents, lives with flatmates or solo, prefers north or south of the river? 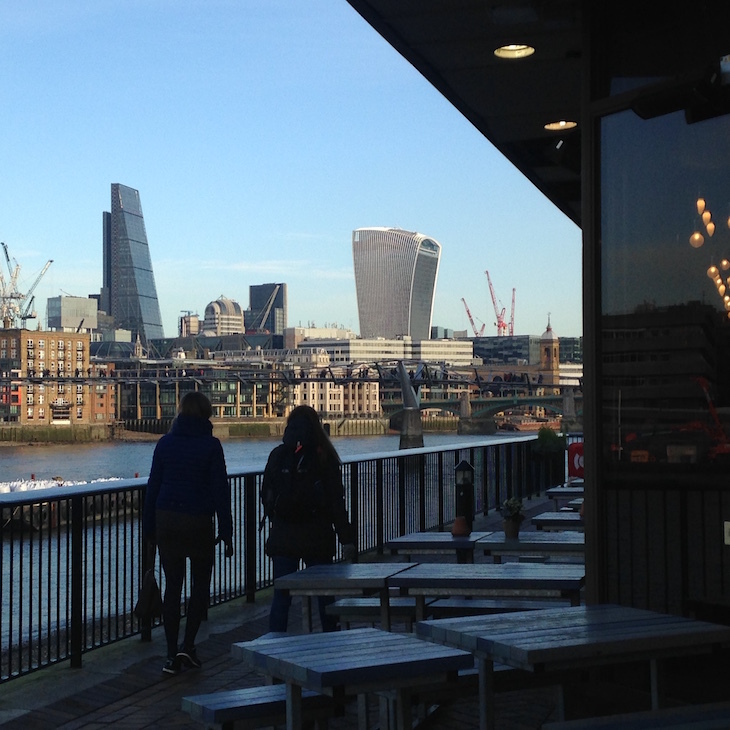 Continuing on past the Oxo Tower and along Gabriel’s Wharf to the South Bank, the Date Walk passes the ITV studios, the British Film Institute and the National Theatre, which should allow for plenty of opportunities to discuss all things television, cinema and theatre-related. 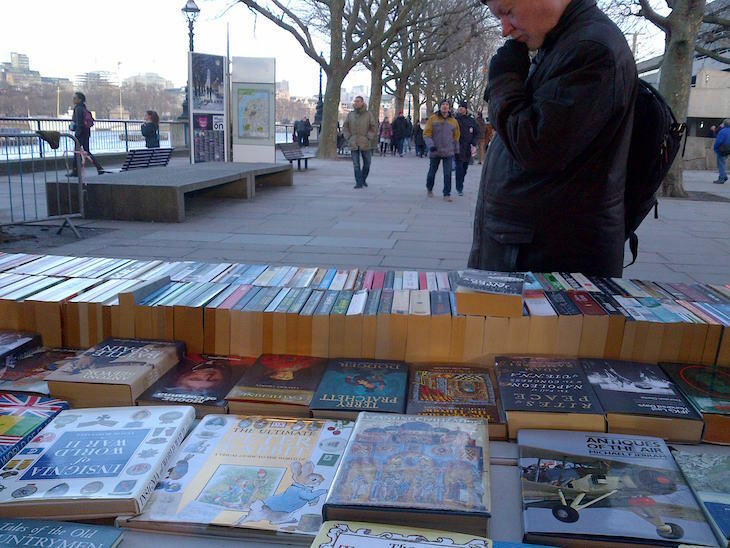 Browse the stalls at the book market on the South Bank. Photo by Allison Goodings. 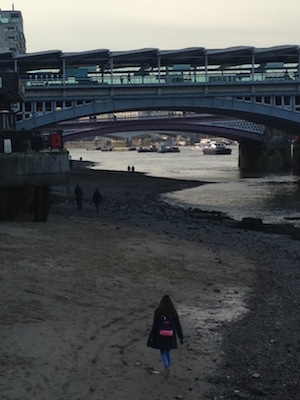 Underneath Waterloo Bridge is the South Bank Book Fair — an open-air second-hand book market which, like Borough Market, was a location for a scene in a great London romantic comedy of note — in this case, Four Weddings and a Funeral. This is an ideal place to determine about your date’s reading habits — are they Dante or Dan Brown? If you’ve made it this far and had a good time, congratulations! The Date Walk can come to an end here — within easy walking distance of Waterloo Station, or via the Golden Jubilee Bridges, Embankment and Charing Cross for your trip home. Alternatively, a romantic spin around the London Eye, watching the sun set over the Houses of Parliament — even Bridget Jones couldn’t ask for a better ending.